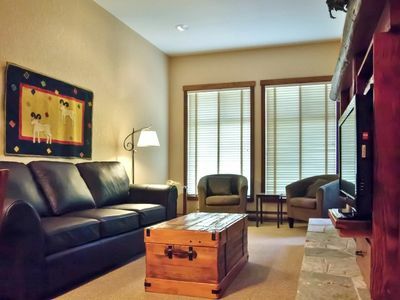 This charming 1 bedroom suite at Snow Creek Lodge features 1 bedroom, 1 bathroom plus a full kitchen, living and dining area. A modest balcony overlooks the beginner slopes here at Fernie Alpine Resort. In a desirable Ski in / Ski out location, stopping in for a break during your ski day is a breeze. The master bedroom of Snow Creek 105 features a King Bed, new in 2014. The living area offers a flat screen television, DVD player and river rock gas fireplace, as well as a new pull out sofa bringing the maximum occupancy for this condo to 4 guests. Step right from the living room or bedroom onto your balcony, and watch your little ones play in the snow or try out the mountain bike skills area. At the end of the day, store your skis in the secure ski storage on the lower level of the building. And if you need to rent, we have that covered too – located in Snow Creek Lodge is Quest Rentals, one of Fernie’s best ski rental shops.